His desk always looked so...big. The only place Elvin could imagine being during the repast, was in the exact same place as the last conversation he would have with his father in law: sitting in Dr. Huxtable's home office. Snagging a bottle of rye whiskey and a glass before hiding away, Elvin spends the entire night sitting with the spirit of his mentor and father in law. Elvin would give anything to have back that last day, a week ago, with Dr. Huxtable. 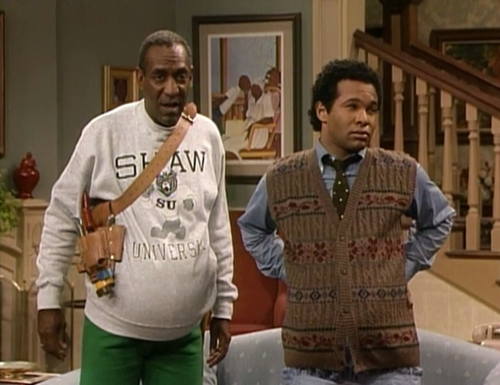 Saturday, September 13, 2015, would be the day Dr. Huxtable became "Cliff" to Elvin. It would be the day his hero would become his friend. "Dr. Huxtable. Are you home?" "Down here, Elvin. I'm in the office." Elvin turns to his left and makes his way down into the home office of the Dr. Heathcliff Huxtable. Once in the office, Elvin greets Dr. Huxtable, who is getting up from his chair, hanging up his doctor's coat on the nearby coat rack. He invites Elvin to sit down. "Thanks, Dad. How are you? How's the baby-makin' business?" "Oh...the babies keep coming, so business is good. How's general practice?" "Oh...the 4th of July and Halloween keeps reminding us idiots exist, with ample proof, so business is good on my end too." "Wait...why do you do that? Bounce back and forth between calling me Dad or Dr. Huxtable? You never call me Cliff. You bounce between the familiar and the formal. Why?" "Well...sir...I don't know. Mostly out of respect, I suppose. The remaining...out of fear." "Oh...I don't know, sir. Twenty-five years later, I still feel like the knucklehead who came into your home, spouting neanderthal notions when it came to women and nearly unraveling your dreams of Sondra being a lawyer and marrying a doctor. I wake up every day thankful for your grace." The two men share a comfortable laugh. In Elvin's mind, no one could admire Dr. Huxtable more than he...and Cliff knows this. Cliff is so aware of Elvin's admiration for him, that today he will forge a new relationship with his son in law. "Elvin, do not fear me. Do not. I'm no one to fear. You have spent your adult life loving my daughter, raising my grandchildren, and healing the sick and wounded. You have, long before today, earned my respect. You have earned...my friendship." "Yes, sir...ah...Cliff..." Elvin tries the new relationship on...and nope...not ready yet, "...you know...Dr. Huxtable..."
"Boy! Just..." Cliff takes a breath and with a slight shake of his head, "...Cliff. Just call me...Cliff." "THERE ya go! See...that wasn't so difficult. Just...Cliff. Elvin and Cliff. Friends." "Just...Cliff. You give the poor man an inch, he takes a mile." "Ok...well...now moving on. I didn't call you over here to...talk about...my name. I called you over because I'm nearing the end." "The end of what, Dad?" "Nearing the end of what, Cliff?" "Many years ago..." Elvin gives a slight sigh as he knows he's about to get a Cliff story. He grants Cliff the respect of the floor. Cliff goes on with his reflection, "...a young man...a young general medicine physician...married a woman...an aspiring attorney...and they...together...had a family. There were many days...and nights...of struggle...of time apart...because of their work...of frustration...but also, of joy. They made this home...from that work...for their children. They loved each other. They built each other up. They raised their children. This has been a fulfilled life." Elvin listens on as Cliff muses about his life as if a change is coming. "Elvin, I called you over today because I want to share something with you." "And I want to share this with you...not my son in law...not as a fellow doctor...but as my friend. Do you understand, Elvin?" "Today, I am retiring from my practice. I am hanging up my coat." "And I want you to take over." "Yes...you. You will take over my practice. You will take over my clients. You will take over my office." Elvin drops his head, hoping to make clear what Dr. Huxtable is saying to him. Cliff adds, "You will take over my home." "Yes. Clair and I have decided to will this house to Sondra...and to you. Clair is going to have a similar discussion with Sondra next week when she returns from Virginia. She's down at Hillman for a trustee's meeting and then over to her family home place, near Richmond. We have decided to retire to Virginia." "That's required for retiring in Virginia." "You know what I mean, Dad..." Cliff gives Elvin a stern look, "...Cliff. Dad doesn't work for this conversation? Ok...fine...Cliff. Cliff...why are you living Brooklyn?" "Well...Clair and I are old. We are no longer getting older. We have arrived." "Don't let Mrs. Huxtable hear you say that. Oh...and I will not, nor will I ever, call her Clair. You'll be Cliff and Mrs. Huxtable from now on." "Still scared of her, eh?" "Clair is getting ornery...rattlesnake ornery." "And you're moving to Virginia...to the country...with a rattlesnake?" Cliff laughs at Elvin's joke. "That's funny, son. I'll have to share that one with her." "We want to enjoy the rest of our lives. We want a slower pace...less noise. Time to walk. Roses to smell..."
"You know...this city hasn't felt the same since that day, fourteen years ago. Losing Martin in the Towers...it hasn't been the same since." The two men fall silent to reflect on the morning of September 11, 2001...to remember Martin. "Listen...Elvin...the house is going to be left to you and Sondra. Raise your children in this house...as we did. Counsel your patients in this office...as I did. Encourage your wife and support her work...as I did. Grow old and happy...in this house...as we did. Son...Dr. Tibideaux...Friend...this is your office. This is your home." "Come on over on this side." Elvin sits, reluctant to give up his position on the visitor side of the desk. Taking the seat will surely mean Cliff's departure. Cliff insists, "Elvin, get up...and come here....here..." Cliff points at the chair, "...herrrrre..."
"Twenty five years ago, I bought my new son in law this gift. This was a gift I held onto until a time, I was certain it would be in great care. I have long since watch you grow and evolve into the son, the doctor, the friend, I have loved this quarter century. Just as I give you the keys to this home, this I give to you, again...and finally...the key to this practice, Dr. Elvin Tibideaux." "To Elvin, straight from my heart." Cliff extends his hand to Elvin for a gentleman's shake. Elvin jumps up and embraces his father in law with the grandest hug he has ever given anyone. Cliff grabs Elvin as lovingly. "Be careful with mom in the wilderness." "Oh...I've made this far with ole Rattlesnake Huxtable...I'll gladly go a little further." "I'm gonna tell mom you said that." "I'm gonna tell her you came up with the name." The two men deepen their embrace and laugh together one last time. Elvin looks across the desk at the empty doctor's chair. He finishes his glass of whiskey and sets the glass on the side table nearest his chair. He gets up from his chair and crosses around to the doctor's seat. He pulls the seat back and with care and reverence, slides down into the throne. "Thank you, Dad...Dr. Huxtable. Thank you...Cliff." I loved Elvin's story. It is beautiful in it's gentle reflective tone. It lives as they all do, somewhere between what was and what is and I adore who these men have become to each other and the subtleness of Elvin's maturity. It was lovely and special.